Kiki Galvin has been fishing for more than 50 years. Having grown up in New York State near the Finger Lakes, an area famous for lake trout and bass, Kiki spent many summers sitting on docks catching fish on good old-fashioned worms and her Zebco rod. But having honed her fly fishing skills for more than 15 years now, that Zebco rod is long since gone. In those years, she has fished up and down the East Coast and likewise made annual trips West to fish the fabled waters of Montana, Wyoming, and Idaho. In 2010, in fact, she completed the Wyoming State “Cuttslam,” a long time personal goal of hers. In June 2002, Kiki was certified by Reel Women Adventures in Idaho as a professional fly fishing guide, and is now sharing her passion for the sport with other would be anglers. Hoping to encourage other women to become more engaged in fly fishing, she is a member and the former President of Chesapeake Women Anglers and has been on the volunteer staff since 2001 of Casting For Recovery (CFR), a national program teaching women how to fly fish as a part of their recovery from breast cancer. In addition, she was a fly casting instructor for the L.L. Bean Outdoor Discovery for four years and has been the casting Instructor for Riverbend Park in Fairfax County, Virginia for six years. In 2006, Kiki became associated with Project Healing Waters at Walter Reed Medical Center and now sits on their board of directors. 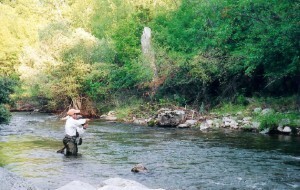 Project Healing Waters is a national program that is modeled after CFR. The casting motion is very therapeutic for upper body and lower body extremity injuries that we see in our combat vets. Kiki is very conservation-minded and is also Vice President of the Northern Virginia Chapter of Trout Unlimited (TU) and was a featured “Stream Champion” in TU’s national publication, “TROUT” magazine. She is also a member and active in the Federation of Fly Fishers and International Women Fly Fishers. She has been featured in Southern Living magazine, as well as the Virginia Wildlife magazine because of her passion and love of not only fly fishing – but sharing that with the greater community in the D.C. Metropolitan area. Kiki’s guiding service can take you throughout Virginia and Maryland for catch and release fly fishing for brook, brown and rainbow trout.